If you're looking to power up a surplus pedestrian or railroad crossing signal, the Dual AC Light Controller is the perfect solution. Accepting standard 120VAC line voltage, this controller provides up to 400 Watts or 3.5 Amps of current per channel and will drive full-sized LED and incandescent crossing lights. The unassembled kit includes instructions (including schematic and parts placement) and all the components to build one complete AC Crossing Light Controller. A soldering iron, solder and a pair of cutters are required for assembly. User selectable time delay from 5 seconds to 60 seconds, (0.2 to 2 seconds for railroad crossing). Separate fixed time for "flashing" don't walk light (0.25 seconds x 10). User selectable setting for either pedestrian or railroad crossing operation. On board crosswalk button as well as an external connection for interactive operation. 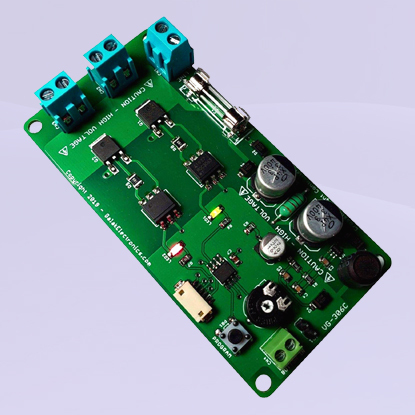 Independent outputs channels for operating LEDs or Incadescent lamps at the input voltage. Onboard LEDs to show current output states. Compatible with virtually all types of 120VAC pedestrian or railroad crossing lights.